Six weeks from now my children will swap their swimsuits for school books but until then they’re enjoying every minute of summer vacation. When I was a child, one of the highlights of summer vacation was visiting water parks with my camp. That memory inspired me to take my children to Splish Splash water park. Despite being from New York, Splish Splash was never a water park I went to as a child. So as first time visitors we headed to Riverhead. After picking up our H2Go bands and a life jacket for my youngest, we started our day. Cliff Diver was the first slide my daughter chose so I waited at the bottom while my older ones enjoyed it. There was no way I was going on it. And thankfully, I had the excuse that their younger brother didn’t meet the height requirement. 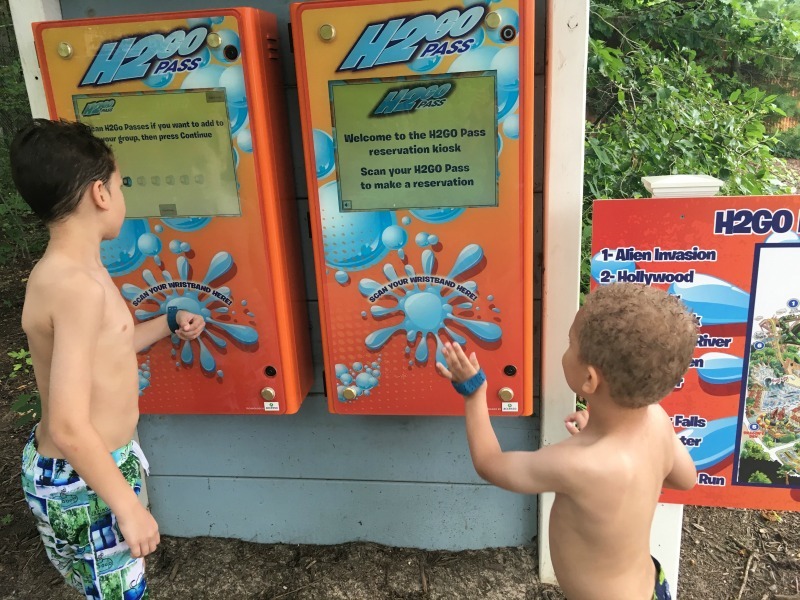 Because we had H2Go bands we waited on much shorter lines and could enjoy other activities — like the classic wave pools — while waiting for our reserved ride times. I loved seeing my ten year old spend time both with his older siblings and with his younger brother. My daughter also spent time with her little brother trying to spray the riders on The Battle of Mutiny Bay. We stopped at the Snack Shack for lunch. My children kept it simple getting cheeseburgers or hot dogs and fries with iced tea. I opted for the spring mix salad, carrots with hummus and coconut water. 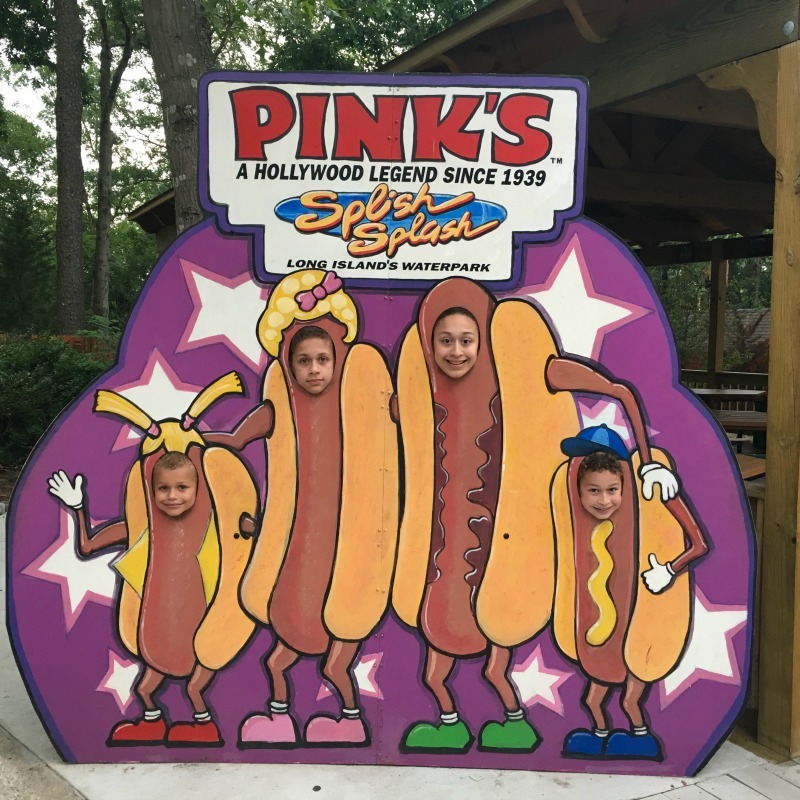 But hanging around water makes me hungry so at the end of our time in the park we stopped for hot dogs from Pink’s — so happy to see the Patt Morrison Baja vegan dog on the menu — and Dippin’ Dots for the kids and a mango Chloe’s soft serve fruit bar for me. They also got refills in their souvenir cups. There was also a bunch of games you could play when not on slides or rides. 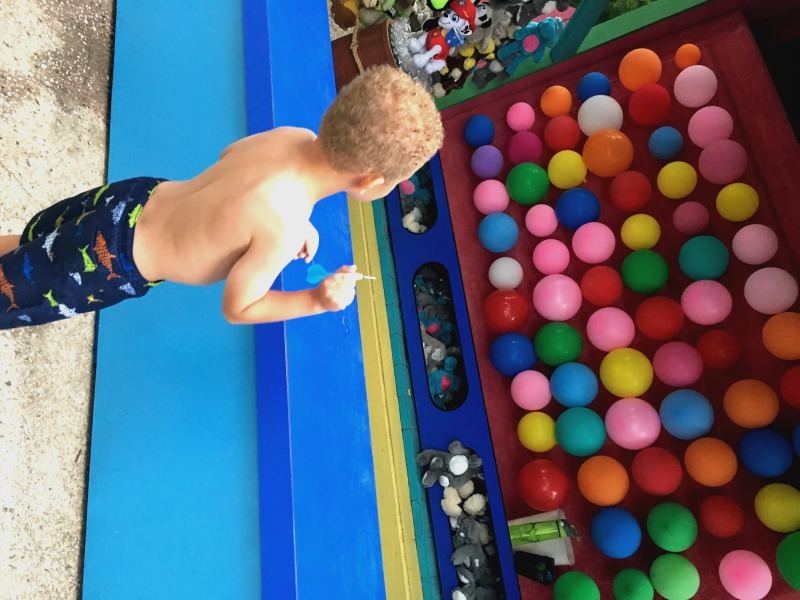 One game had special perks for younger kids allowing them to shoot darts until they popped a balloon in exchange for an inflatable. My six year old hit the dart on the first try. Superstar! 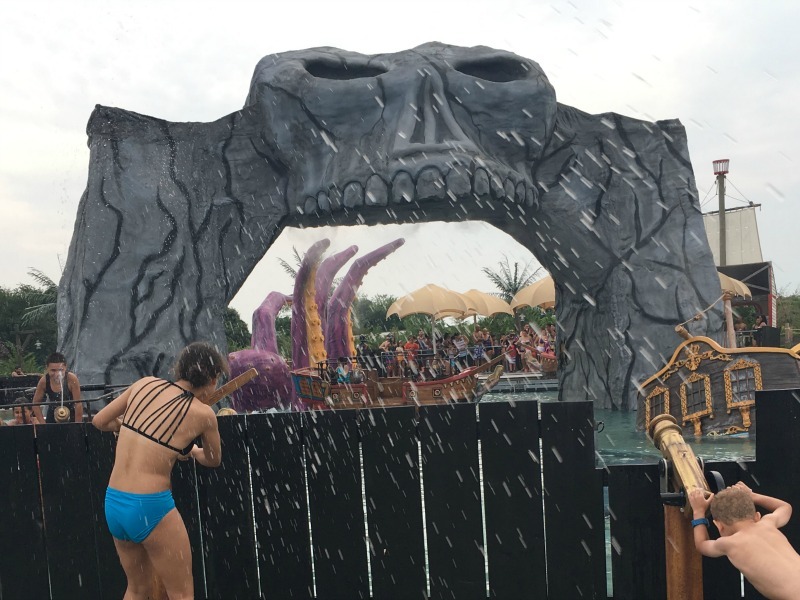 We ended up closing down Splish Splash. The park closes at 7 on Saturdays and we were one of many families emptying out their lockers when the “Get out of the water” song started playing. We left the park only missing two of the 18 attractions between all of us. This sounds like a great place! 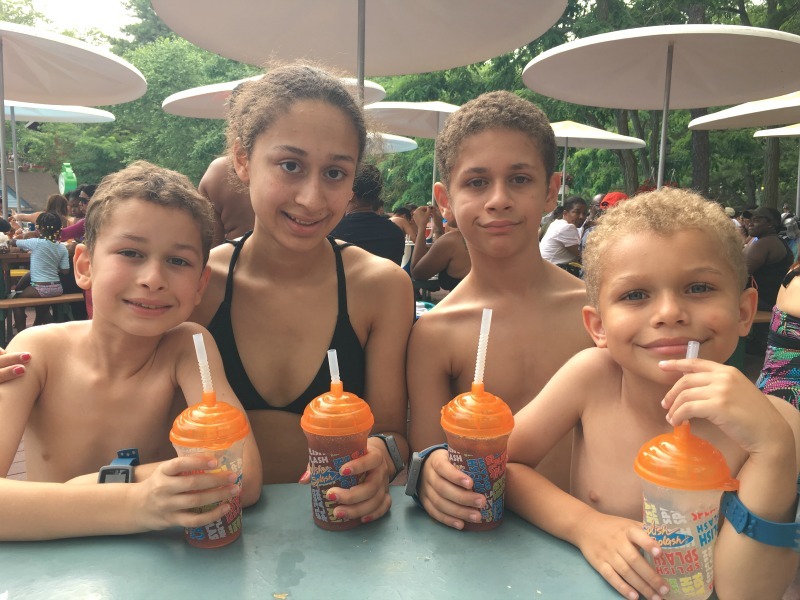 My kids love water parks, we will definitely paying a few visits over the Summer too! THis looks so fun! My parents took us to water parks like this when we were young and we had such a great time! And blast was had by all! I’m really glad I’m taking my children to water parks so they have the memory when they are adults. Looks like you guys had a fun time. Perfect for the kids. Thanks for sharing. Had so much fun! They loved it. Aww I love that they had a blast! Unfortunately for me I haven’t made a trip to the waterpark.. yet! I just moved and unpacking and with my son doing 3 different therapies a week I can’t up and leave.. looks like you had a blast! Hey fellow NYC mama! 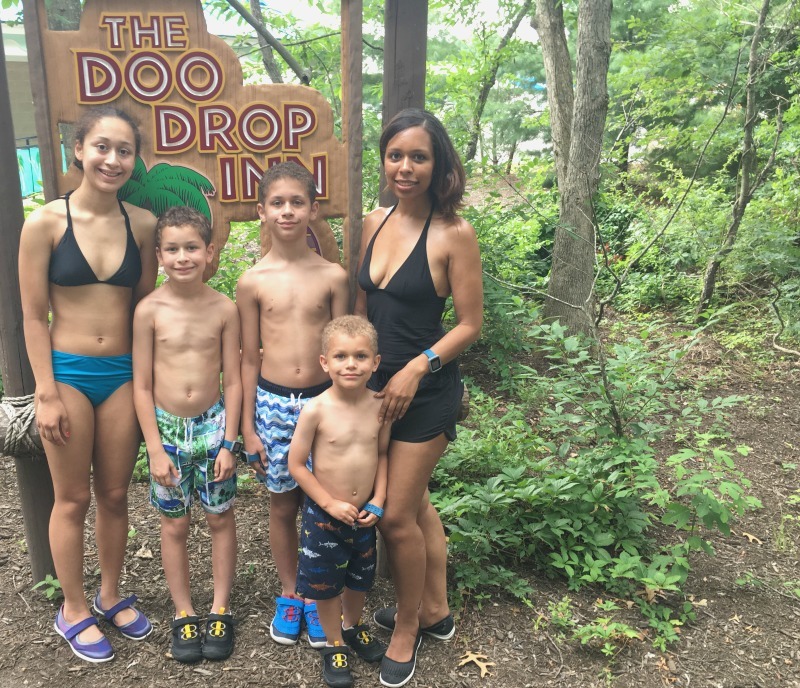 Splish Splash is a must do for us, at least once in the summer. When we were kids, my husband and I went to the same elementary school and they used to take us to Splish Splash as a year end trip. It always brings back so many memories for us. We ever got to go there. I was happy to visit for the first time with my kids. Hope you get a chance before the season is over. 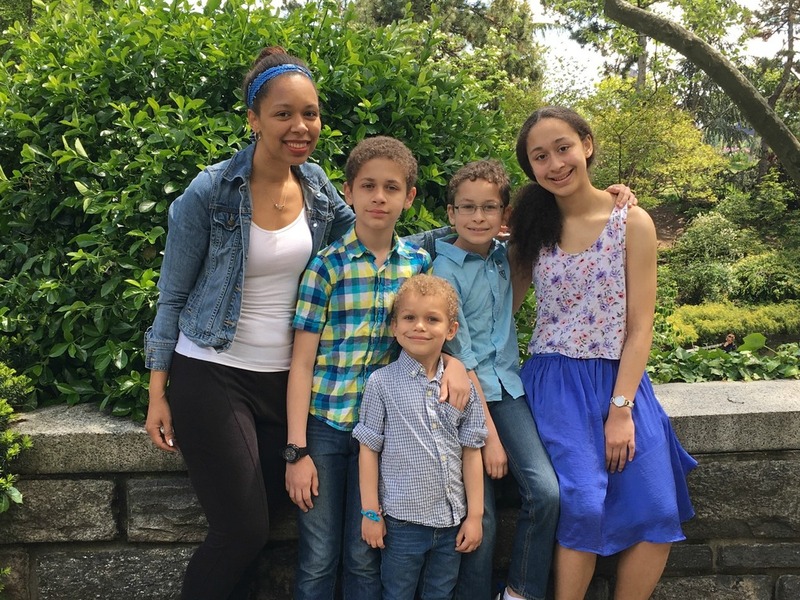 You have a beautiful family and they really looked liked they enjoyed themselves. I love water parks they are so much fun, I’ve never been to Splish Splash because I’m not close to you but it reminds me of some other water parks I’ve visited. This sounds like a great water park to visit. I like that there are bands that allow extra perks. I was also surprised by the menu. Many of the water parks I have visited do not offer vegan or healthier options to serve visitors. I’m glad your family shut down the park. and that you had a great visit. Aww by the looks of the photos I could tell they had a great time! 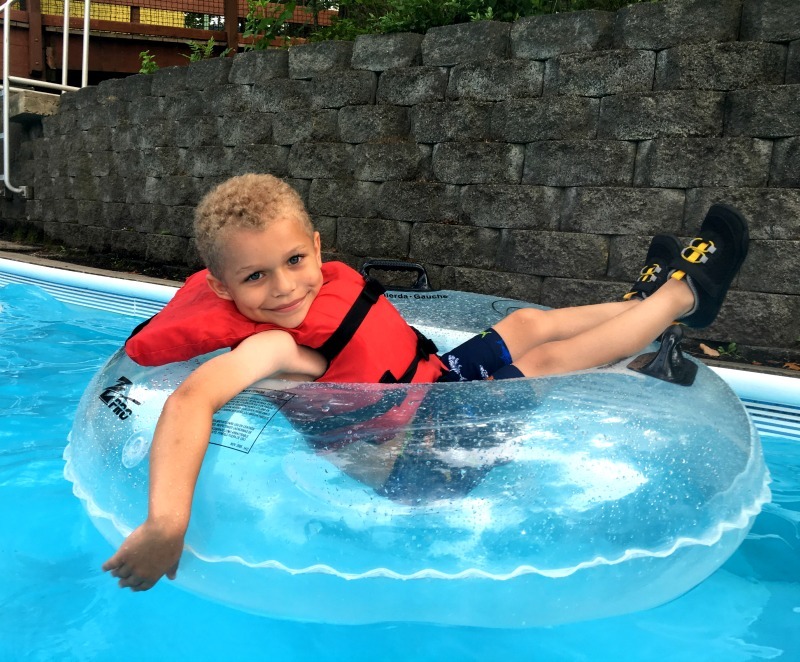 Water parks are a great idea for children! Your kids are beautiful! What a great time. I love a good water park, but I usually stay in the lazy river all day soaking up the sun!! Thanks 🙂 The lazy river isn’t a bad place to be! My husband is from Long Island! We were just there last weekend for his sister’s wedding! He really wanted to go to Splish Splash while we were there, but we just ran out of time. Thanks for sharing! We are absolutely going to have to go! Your kids are so cute, and I wish I was at a water park like this. Looks so much fun! To be a kid again 🙂 I think I need to see if they have a place like this in Vancouver. Looks like a great place for a family outing. Sounds like you all enjoyed it. We’ll consider going soon! Sounds like a great place to hang out with kids and beat the summer heat! As an adult, I’m too fond of the lazy river! Nothing like relaxing on the water! How funny! We are in Manhattan but have left the city a few times this summer. It’s fun to get away. Sorry you ran out of time. I think you would have had fun. The little man is such a cutie! I live in Atlanta but spend quite a bit of time in Memphis. I really wish they had some kind of water park there! Wow, missed only 2 out of 18 attractions…seems like you guys had some serious fun : ) . Lovely memories for kids when they grow up! Sounds like you need a trip to NY, Candy! This looked like such a fun day for the kids! Unfortunately, the weather here hasn’t been so great for summer activities & we haven’t been able to visit the water park near our new house. Hopefully the sun comes out soon! I love a good water park! One just opened up near me, and I’m not ashamed to go alone 🙂 Looks like it was a really fun time! It looks like an amazing place to take your kids to cool off. I am going to remember this wen we go. I am sure my kids will enjoy it. I love love love water parks. I’ll have to take a trip and check it out with my own kids!! Oh no! Hope you get some sunny weather soon.